Seeing the monument of Daisy's in Oak Hill Cemetery raised many questions for us. We know that she died on Christmas day in 1895 and the tree monument bears her birth and death date with the inscription; “This Is Why The Angels Sang On That Christmas Morning”. We had many other questions about her, and the family included in the plot surrounding these two wonderful monuments. It was evident Daisy's mother was buried there, but not the father. Her Uncle John was there and her Aunt Alice was there. Where was the Father? Who was the little seven year old girl Marion Mentz? Though our research has not yet uncovered exactly how Daisy died, we were able to answer many of the other questions about her & her family. We are happy to share this with the Historical Society and put new insight into this families interesting history. Francis Marion Conroy born in April 1845 to James A. Conroy (b: Dublin, Ireland) and Bertha Dillenger (b: Maryland) Francis married Clara M. Glynn in 1884, she was born in December 1852 in Michigan the daughter of Charles W. Glynn and Mary E. Pray (3). -- Daisy F. Conroy b: May 20, 1885 d: December 25, 1895. Buried at Oak Hill Cemetery in Hammond, Indiana. -- Alice Irene Conroy b: July 1, 1888 (1). -- Francis and Clara have been married for 16 years. -- Clara has mothered two children but only one is living; Irene. -- Francis' occupation is a Lawyer. -- First enlisting in Wilmington, Illinois on September 1, 1861 his Rank was Private; Company A Unit 39 Regiment Illinois Infantry. -- Discharged on June 1, 1862 in Williamsport, Maryland. -- Enlisted on August 9, 1862 in Wilmington, Illinois his Rank was Corporal; Company A Unit 100 Regiment Illinois Infantry. -- Discharged on July 12, 1865 in Chicago, Illinois. -- On September 1, 1864 while battling in Jonesboro, Georgia he suffered a gunshot wound to the side of his head and Myalgia. -- For his service he received a $30 pension. -- In the 1906 Hammond City Directory Page 21 - Francis and Clara are living at 83 Sibley in Hammond, IN also shows Francis is an attorney with an office at 51 Muenich Ct. in Hammond, IN. 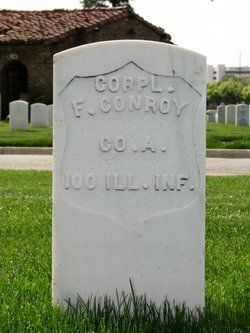 -- U.S. National Homes for Disabled Volunteer Soldiers, 1866-1938 Record for Francis Conroy (City: Sawtelle > Record Type: Registers > G > Page: 352) has him listed as a lawyer under his Domestic History. Religion is listed as Protestant. 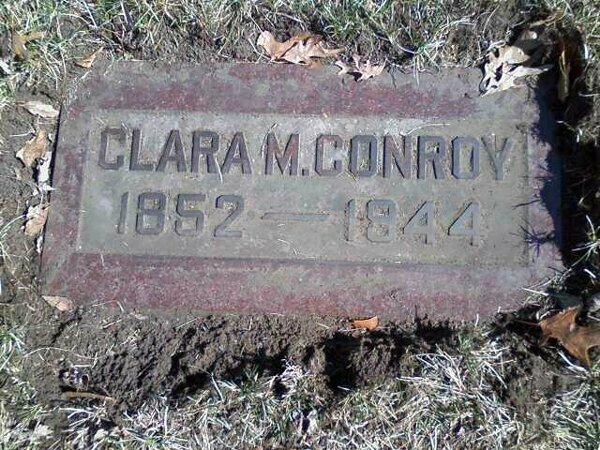 Name and Address of Nearest Living Relative is Clara M. Conroy (wife) Hammond, Ind. Francis and Clara divorced sometime before 1910 and after several visits to Los Angeles, California, Francis moved there permanently. On January 7, 1910 he remarried to Minnie J. (Herring) (Magendie). No children were had and Francis died on August 30, 1915 in Los Angeles, California. He is buried at Los Angeles National Cemetery Plot: 27, R-A 6. Clara M. (Glynn) Conroy, Daisy's mother never remarried. -- In 1920 she is residing with her now married daughter Alice Irene Mentz and her family at 6324 N. Paulina in Chicago, Cook, Illinois. -- In 1930 Clara is residing with her 72 year old sister, Alice Haney at 1210 Madison Street in Hammond, Lake, Indiana. 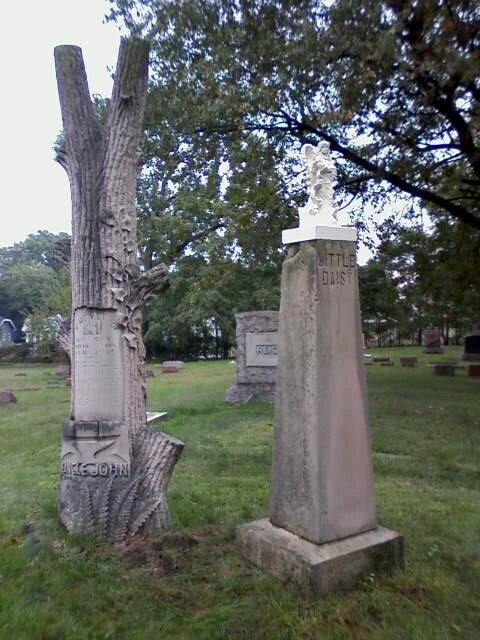 Alice (Glynn) married John C. Haney (2) and they are both buried at Oak Hill Cemetery in Hammond, Indiana. Alice Irene Conroy (1), Daisy's sister was born on July 1, 1888 the daughter of Francis M. Conroy (1845-1915) and Clara M. Glynn (1852-1944) married Robert R. Mentz on October 25, 1906 in Chicago, Cook, Illinois. Robert R. Mentz was born on Sept. 11, 1885 in New York the son of John P. Mentz (1846-1936) and Mary Hartford (1845- ). 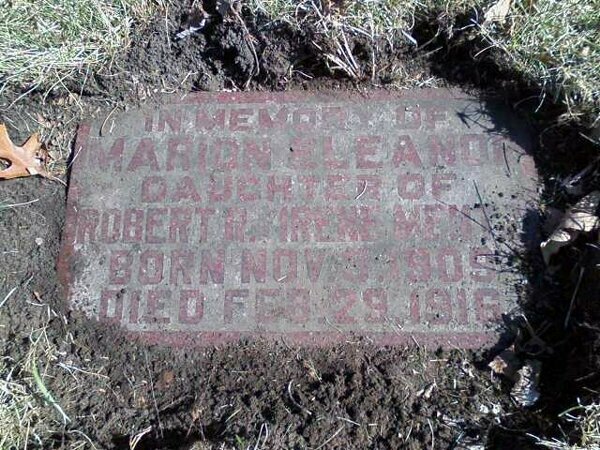 -- Marion Eleanor Mentz, (1909 – 1916) She is buried at Oak Hill Cemetery by her Aunt Daisy F. Conroy. -- John R. Mentz (1920 – 1973) m: Jerree Maxine Adams (1920 – 1993) They had children. (1) Alice Irene (Conroy) Mentz died in 1953 in Dade County, Florida. Robert Richard Mentz died on November 6, 1947 in Oak Park, Cook, Illinois. Alice Irene (Conroy) Mentz had moved to Florida and remarried after Robert's death. She married George G. Temple on October 16, 1950 in Broward, Florida. (2) John C. Haney “Uncle John” was one of 13 children born to Pearce Haney 1816 – 1882 and Mary Horn 1821 – 1907. He was born on August 31st 1846 in Pennsylvania where the family had been since around the mid 1700's. John's father was the first to leave Pennsylvania, migrating to Noble County, Indiana around 1854 were he died and is buried in Rose Hill Cemetery. John C. Haney married Alice O. Glynn on September 20, 1874 in Noble, Indiana. They both lived pretty well, from 1900 - 1920 John owns their homes at 43 and 45 Sibley Street in Hammond, Indiana. The home at 43 Sibley Street must have been a boarding house as in 1910 they have 10 roomers and a servant. His occupation was a blacksmith. Around 1923 John purchased the home where Alice is living in 1930 after his death with her sister (Clara Conroy) at 1210 Madison Street in Hammond, Indiana which is worth $6000.00. John and Alice never had any children. John C. Haney died in 1927.